We are a very experienced team delivering specialist advice on UK Immigration & British Nationality law. One of the UK's top specialists in immigration and nationality law. David Webb is a senior solicitor of many years standing who has been actively involved in the field of UK immigration and British nationality law for over thirty years. His early career involved not only working at Baker & McKenzie (the world’s largest commercial law firm) for five years, but also for Tower Hamlets Law Centre (based in the east-end of London) for a similar period of time. Previously a partner at Gherson & Co, he has for the last twenty years been the Principal of DJ Webb & Co. His wide experience means that he is able to advise and assist in all areas from appeals against deportation to admission of investors and entrepreneurs. Over the years Mr Webb has held various official positions including that of the Chief Assessor of the Law Society Immigration Law Panel and a Law Centre Trustee. He was a founder member of the Immigration Law Practitioners Association (‘ILPA’), and was previously on the Editorial Advisory Board of ‘The Journal of Immigration, Asylum and Nationality Law’. For the last fifteen years he has been a part-time Immigration Judge sitting at various Hearing Centres throughout the United Kingdom. He is the author of numerous legal articles and legal texts in the field of immigration law and he has over the years worked with and trained a number of individuals who are now themselves also regarded as leading practitioners in this area of law. Ravi is a partner in the practice and brings a wealth of experience from government and private practice. Formerly a Presenting Officer with the Home Office and solicitor at Fragomen LLP, he has gone on to develop a strong practice in both business and personal immigration. He has acted for Blue Chip companies across all sectors including assisting with Sponsor Licence applications and applications under Tier 2 of the Points Based System. He also has extensive experience in advising high net worth individuals including advising on Tier 1 Investor and Entrepreneur applications. He has additionally advised and assisted individuals in the areas of European Union, Asylum and Human Rights law. Ravi frequently appears before the First-tier and Upper Tribunals in appeals against deportation decisions, deprivation of citizenship decisions and human rights decisions. He has developed a large Judicial Review practice where has had numerous successes including ‘certification’ challenges and stays of removal. Ravi has been instructed to provide opinions on matters of immigration law and procedure and British nationality in other jurisdictions. Ilknur studied law at Brunel University and City University London, completing her LPC in 2016. She has been practising in the field of immigration law since 2015, and qualified as a solicitor in 2018 undertaken ‘seats’ in immigration, crime and family law. Ilknur has advised on a range of immigration and nationality cases including complex human rights claims and EU rights of residence and applications under the Turkish Association Agreement. Ilknur is fluent in Turkish. Samir studied Law at Birmingham University, and completed his Legal Practice Course in 2011. Following the completion of his academic studies, he relocated to Bristol and joined a national firm that specialised in Consumer and Commercial Litigation. Before joining DJ Webb & Co Solicitors he was a senior litigator at the Government Legal Department, which represents the Secretary of State for the Home Department in judicial review proceedings and appeals to the Court of Appeal. Samir has developed a strong practice in personal and business immigration, and frequently appears before the First-tier Tribunal in appeals against EEA and human rights decisions. He also continues to develop his Judicial Review practice. 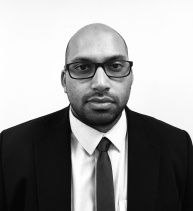 Sonu Vijh is a highly experienced solicitor who has been working for DJ Webb & Co since March 2003. Her immigration practice covers all aspects of immigration and nationality law. She provides practical, professional advice on all stages of the application process; prepares all the necessary paperwork for appeals and also represents clients at court. She carries out her work carefully and efficiently. Client often express how clearly they see their situation after their initial consultation with her. She has a wealth of experience in the full range of entry clearance and in-country applications including family reunion cases, European cases, points-based system applications and non-points based system employment related applications. She has advised and assisted on applications at British High Commissions and British Embassies around the world. She also speaks Hindi and Punjabi. Our experienced Senior Receptionist and Administrative Officer, has been with DJ Webb & Co for sixteen years. Anne is a Psychology and Business graduate from New Era University in Manila, with follow-up studies in Geneva and London. Her multinational experience in Asia and Europe in running businesses and managing client relations, ensures DJ Webb & Co’s clients are well cared for. In bring to this frontline position a cosmopolitan approach, Anne represents the quintessential essence of DJ Webb & Co’s practice and its international clientele in both corporate and private areas. Anne will address your enquiries in English, French or Tagalog, ensuring that your immigration questions and follow up meetings are put through to the most appropriate solicitor for your case.